Since their technologies are so different, determining whether to choose a pneumatic or electric actuator for a process system may seem confusing. Typically, electric actuators are known for their high levels of precision while pneumatic actuators are considered less expensive and easier to maintain. Each technology has its inherent advantages and disadvantages and the criteria below should be considered to ensure the best actuator for the application is purchased. 1. 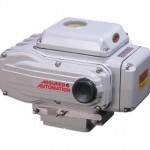 Power Source- Determine the most effective power source for the actuator taking into account power source availability, torque at valve stem, failure mode, control accessories, speed of operation, plant environment and size of valve. Most pneumatic air operators require an air pressure supply of 40 to 120 psi. Generally they are sized for a supply pressure of 60 to 80 psi. Higher air pressure is usually difficult to guarantee and lower pressures require a large diameter piston or diaphragm to generate usable torque. Most electric actuators require a 115 VAC or 24 VDC power supply, and are available in a variety of AC and DC motors in single phase and three phase. Pneumatic actuators typically handle temperature ranges between -4 and 175°F but can reach -40 to 250°F with specialized seals and bearings. The quality of the supply air pressure in relation to dew point should be considered in low-temperature applications. (Dew point is the temperature at which condensation occurs in air) Condensate may freeze and block air supply lines, making the actuator inoperable. Electric actuators operate best at temperatures between -40 and 150°F but are also subject to problems due to moisture and temperature. When used outdoors, electric actuators should be sealed from the environment to prevent moisture build up and subsequent potential damage. Even if properly sealed, condensation may still form, due to the heating and cooling of the enclosure from the motor’s heat. Electric actuators used outdoors should have a heater and thermostat installed to maintain a constant temperature and eliminate condensation. 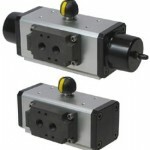 Pneumatic actuators are inherently explosion proof and are a good choice in NEMA VII designated areas. If compressed air is not available or cannot provide the operation characteristics required then electric actuators may be used. 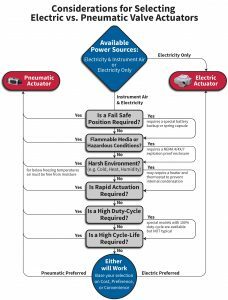 Most electric actuator manufacturers have an enclosure option that conforms to Nema VII standards. 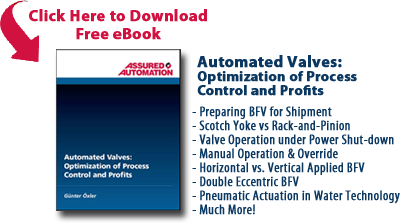 Spring return or fail-safe option is a widely specified safety feature on valve actuators. Upon power/signal failure, a spring return actuator drives the valve to a predetermined safe position. Pneumatic actuators typically offer this inexpensive option while electric actuators are not widely available in a spring return version. When deciding between pneumatic or electric actuators, key performance characteristics such as duty cycle, stalling, speed control, modulating service and torque to weight ratio should also be taken into consideration. Not subject to overheating, not sensitive to wet environment Can overheat. Must be sealed from moisture. This entry was posted in Latest News and tagged Electric Actuators, Pneumatic Actuators. Bookmark the permalink.